Things almost went out of control for Real Madrid this Sunday night, after having reached a two goal lead early in the game and seeing the referee sending off Sergio Ramos. Álvaro Morata and Ramos scored the Merengues goals still inside the first quarter of an hour, but the Spanish defender would then see two yellow cards in roughly 44 seconds, forcing his team to play with 10 men for more than 70 minutes. Real Madrid defeated Rayo Vallecano at the Santiago Bernabéu tonight, in a 2-0 win where the story of the game can very well be resumed to the first 20 minutes of the encounter. Alvaro Morata took Karim Benzema's place in the Merengues line-up and scored the opener with only 3 minutes played, while Sergio Ramos extended the lead a few minutes later, after a good header from a cross by Mesut Ozil. The unexpected took place right after, as Sergio Ramos somehow managed to be shown two yellow cards in two straight plays, leaving his side with the task of facing more than 70 minutes of the game with only 10 men. Cristiano Ronaldo played the full 90 minutes, but ended up being a victim of this game circumstances, and didn't get many chances to create dangerous attacking plays. With no games in sight in Real Madrid's schedule until next Saturday, the Merengues knew they wouldn't need to spare efforts in this game against Rayo Vallecano, despite having played against Manchester United in mid-week, in that 1-1 home draw for the UEFA Champions League first leg. José Mourinho's men started the game in full force, immediatly putting Rayo Vallecano against the ropes and earning a two goal lead. However, what happened next was certainly unpredictable, as Sergio Ramos got sent off after seeing two yellow cards in only 44 seconds, a situation which led to Real Madrid losing the initiative in the game. From that point onwards, Rayo Vallecano had a lot more ball possession than the Merengues (67% vs 33% at the end), but the true is that they were unable to really bother Diego López as they should have had, being one man up for such a long period. 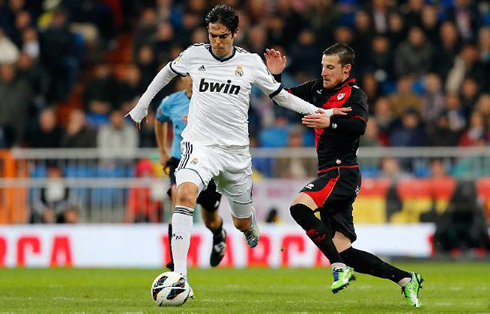 The first goal was scored in the 3rd minute of the game, after a good attacking run by Ricardo Kaká, who found Mesut Ozil with space on the right. The German midfielder didn't lose time to attempt to return the pass with a low cross near the penalty spot for Kaká, but the Brazilian couldn't put his brakes on and let the ball pass for Álvaro Morata, who finished it easily to put the Merengues on the lead. Cristiano Ronaldo still had to jump to avoid any deflection on Morata's shot and being caught offside, and therefore, he ended up having no interference whatsoever in the play. Ten minutes after Morata's goal, Real Madrid got their second on the night, but this time, the goalscorer was Sergio Ramos. Mesut Ozil also recorded his second assist in the game, as it was his free-kick cross who allowed for the Sevillian to head the ball past Rúben (Rayo Vallecano's goalkeeper), and make it 2-0 for Real Madrid. In the scrumble inside the penalty area, Varane seems to have been pulled from his shirt, but the referee let it slide. The match ended with a 2-0 victory for Real Madrid, in what was José Mourinho's 100th game for Real Madrid in La Liga. Since the top four teams in the league won their respective fixtures, everything stays the same in the standings, as we now have 14 games left to be played until the end of the Spanish League season. 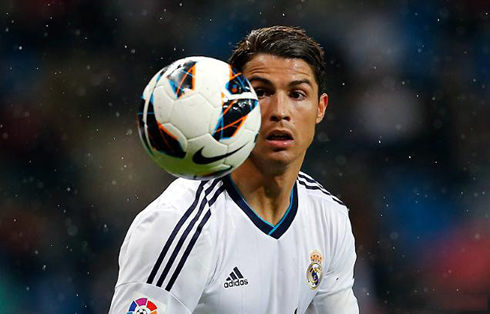 Cristiano Ronaldo next game for Real Madrid will be against Deportivo de la Coruña, on February 23, 2013. You can watch Juventus live stream, Deportivo de la Coruña vs Real Madrid, Milan vs Barcelona, Manchester United vs Reading and Porto vs Malaga, all matches provided from our football live streamings section.